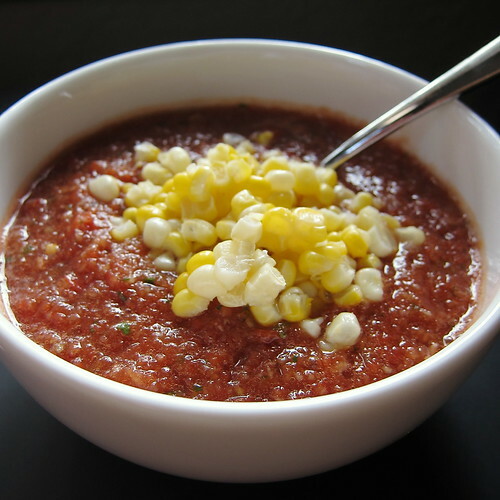 When the tomatoes are ripe and the temps soar into the triple digits, it's the right time of year for gazpacho. Really, there is nothing like a bowl of this cooling soup with some crusty bread when the thought of turning on the oven, or even the grill, seems unbearable. Ok, you do have to turn on the stove for this, but just briefly to blanch the tomatoes to remove the skins. Do it in the morning before the house heats up. I just winged it with this version using what vegetables we had on hand and adding things I thought sounded good. Funny thing is, it's probably the best version of gazpacho I've ever made. All the flavors blend together so one vegetable doesn't over power the rest. The balsamic adds some depth and the red pepper flakes a litte zing. The color is a gorgeous deep red. Cilantro, while not typical in gazpacho, really goes with it beautifully, but if you are one of those people who can't eat cilantro leave it out. I can't recommend topping it with sweet corn more, the crunch and sweetness it adds is really something special. Put everything in a blender or food processor. Process until everything is chopped but the soup still has a little texture. Taste for seasoning and add salt if needed. My gosh, this looks so good! Yeah, it's been so hot, and I haven't even considered gazpacho. I just picked a bunch of tomatoes, too, before it gets stormy! I just need some corn and I already went to the store. Bummer! Our cucumbers are still lagging behind the tomatoes. As soon as I can get both at the same time, I will be making a big bowl of this! If you really don't want to turn on the stove, I just read a tip in Fine Cooking that a ceramic vegetable peeler is sharp enough to peel tomatoes and does not have a serrated edge to get all tangled up and make tomato skin mush. Thanks for another lovely post! i love the idea of garnishing it with fresh corn kernels! so nice, kat. I just boil the kettle for peeling tomatoes! This is the most perfect-looking gazpacho. Foodycat - Why didn't I think of that?! Love my electric kettle. Oh, this is perfect with the hot weather we're having.